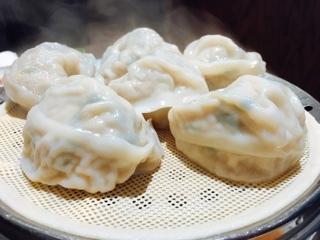 If the king-sized dumplings ($10.99) are what attracts you to Myungdong Kalkuksu Noodle and Shabu Shabu, they're worth a try but don’t get too excited. For me, there's a reason the dumplings didn't make it into the restaurant's name (after all, they're highlighting "noodles" and "shabu shabu"); sure the gigantic tennis ball sized look impressive, but they merely taste passable. 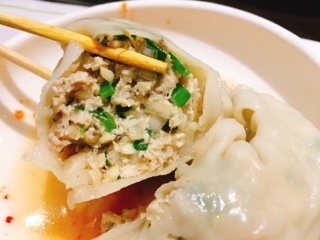 The pork filling is combined with a filler, which could be egg white, so there's a crumbly texture to the dumpling with little actual meat flavour. What stands out the most is the chives peppered throughout creating a rather bland dumpling that really requires kimchi, hot sauce, or ponzu for flavour. Moreover, what I love most about dumplings is the juices that collect within the wrapper… at Myungdong Kalkuksu there is none. 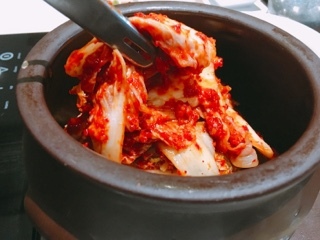 Luckily, you’ll get plenty of kimchi and having heard the compliments from reviewers about this complimentary side dish, I can see why it’s so well regarded. The cabbage is fresh and crispy and the spicy sauce spiked with tons of garlic for an aromatic heat. Our table of two almost finished the entire jar. 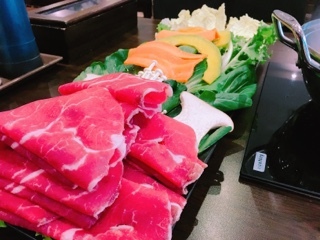 Their shabu shabu ($15.99 a person for a minimum of 2 people) is a fair size, especially if you add on dumplings, and has a sufficient amount of thinly sliced beef. For “two thirds plate full” individuals, it comes with tons of vegetables (napa cabbage, a slightly bitter leafy green, baby bok choy, pumpkin, and carrot) and mushrooms (prince and enoki). Dig through the leafy greens and you’ll also find four glutinous rice dumplings, filled with sweet potato and cheese, which takes a while to cook, but have a great chewy texture. The actual shabu shabu broth doesn't have the lump of collagen you’ll find in Japan, so it relatively plain. However, once all the beef, vegetables, and mushrooms infuse into the soup, the ingredients help to add flavour. 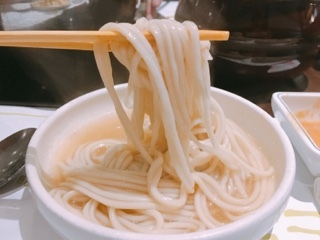 After finishing everything, our waitress brings overs noodles and places it into the broth. 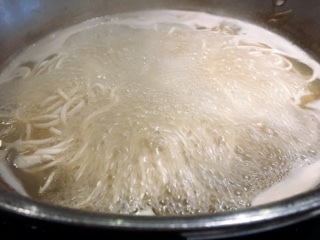 We’re advised to cook them for four minutes and then dug into a bowl of chewy springy noodles. After adding the infused broth and a couple pieces of chopped up kimchi, it was a satisfying last bowl. Much of what’s served at Myungdong Kalkuksu is made in-house: the king-sized dumplings, chewy noodles, and the garlicky kimichi. While paying for the bill, the owner joked that even the after dinner mints were house-made – they’re not but could be given their haphazard rustic look. I love the homey comfort food meal, just maybe not the dumplings.